Many caregivers worry about affording nursing home care for patients if Medicaid funding continues to tighten in Iowa. The Cedar Rapids man has nearly depleted the couple’s life savings as Marie struggles with Alzheimer’s, a progressive type of dementia that affects memory, thinking and behavior. 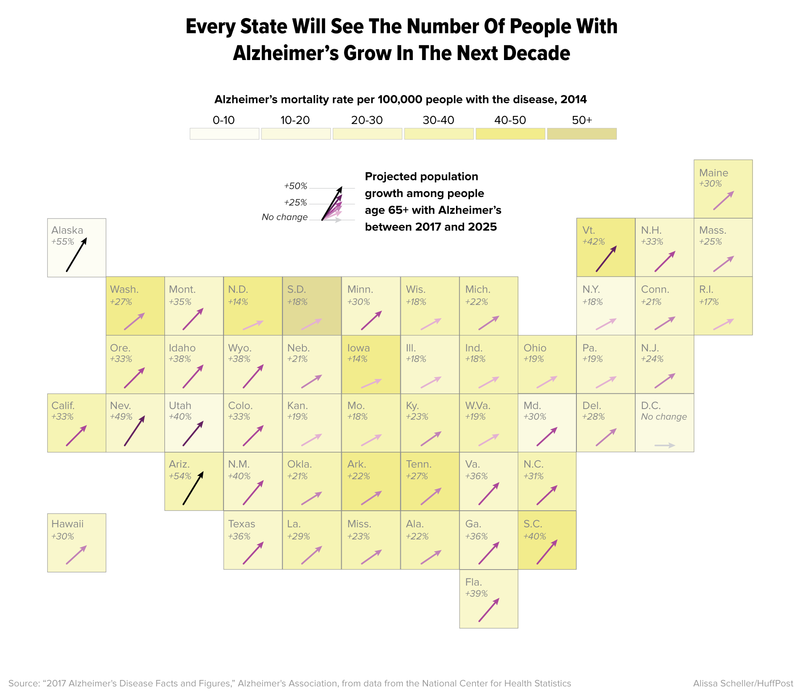 The aging population is fueling what some health experts call an “Alzheimer’s tsunami” for which Iowa, and the rest of the nation, is ill-prepared. Unless a cure is found, an estimated 7.1 million Americans age 65 and older could have Alzheimer’s by 2025, almost a 35 percent increase, according to the Alzheimer’s Association. Iowa’s 65-plus population is above the national average. 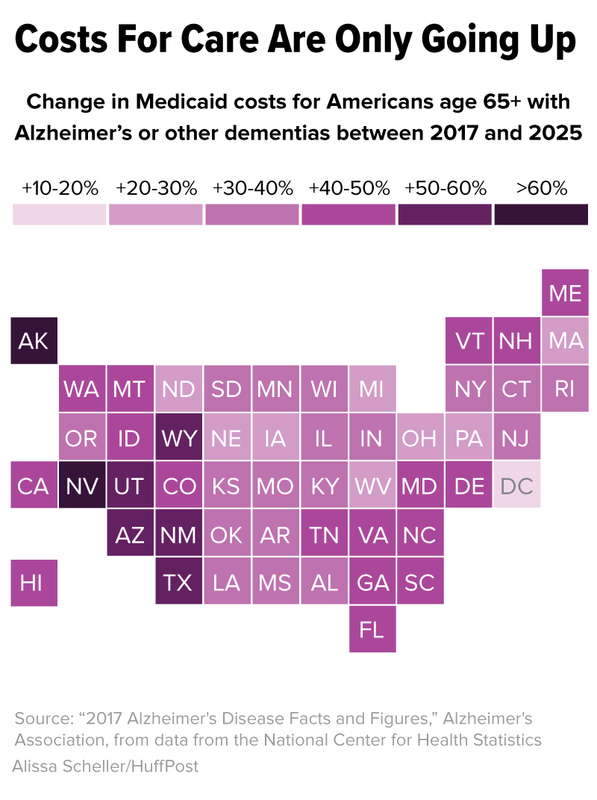 But instead of preparing for the onslaught, Iowa and other states have begun tightening Medicaid, the only government program that pays for nursing home care, in ways that increase the burden on those with Alzheimer’s and their loved ones. Many states are likely to further slash Medicaid funding if Congress passes Obamacare repeal legislation. Marie has spent nearly 14 years at the Hiawatha Care Center, after being diagnosed with Alzheimer’s 25 years ago. The couple’s 67th anniversary was in January. Until two years ago, Lou paid for her care from savings. As the couple’s assets dwindled, she became eligible for Medicaid, which now covers the nursing home expense. Lou described Marie, 91, as a good woman who took care of the house and their five children, including a son born with Down syndrome who lived to age 47 with her support. After his wife was diagnosed, Lou tried to take care of her at home, but her condition deteriorated. For the past 10 years, she has been nearly bedridden. “I’m not sure if she can hear or see,” he said. Marie’s eyes shine and a smile lights up her face in a family photo from decades ago. Now, she’s hunched into a wheelchair, and her husband said it’s hard to know what she is thinking. Nursing aides use a lift to move her from her bed into the chair, where she can be rolled into the lunchroom “and that’s her life,” he said. They sit outside in good weather until mealtime, then come inside to her regular table. Marie, at 5-foot-1, has lost height and weight in recent years and appears tiny next to her 6-foot-5 husband. He drapes his arm over her sweater-covered shoulders, and his blue eyes look intently as he gently lifts her head to spoon pureed green beans, mashed potatoes and meatloaf into her mouth. Even that task, tenderly executed, has become challenging lately, with Marie having difficulty holding up her head to eat. And, as with his unanswered question about what an Alzheimer’s diagnosis truly means, Lou wonders what the next step will be with her meals. He trusts in a higher power to answer. “It’s all in God’s hands,” he said. For now, Marie is physically healthy, and Lou said he’s happy with the staff at the care center. “That is great, because I can go home and feel like she’s being taken care of properly,” he said, adding that it would be impossible for him to provide the same level of care at home. Medicaid, typically seen as the government health insurance program for people with low incomes and those with disabilities, spends about one-quarter of its $4.8 billion in annual funding in Iowa for nursing home care. The program pays for half the nursing home residents in the state, according to the Kaiser Family Foundation. The Alzheimer’s Association calls the disease a triple threat, with growing prevalence, few treatment options and enormous costs. Medicaid spending in 2015 for Iowans diagnosed with Alzheimer’s totaled $576 million, the group reported, and is predicted to increase almost 34 percent by 2025. The Iowa Department of Human Services said $64.3 million was spent in fiscal 2017, just on long-term care facilities for people diagnosed with Alzheimer’s. Iowa’s Medicaid numbers reflect the rest of the nation, said Brandon Geib, who until recently was public policy director for the Alzheimer’s Association for the state. 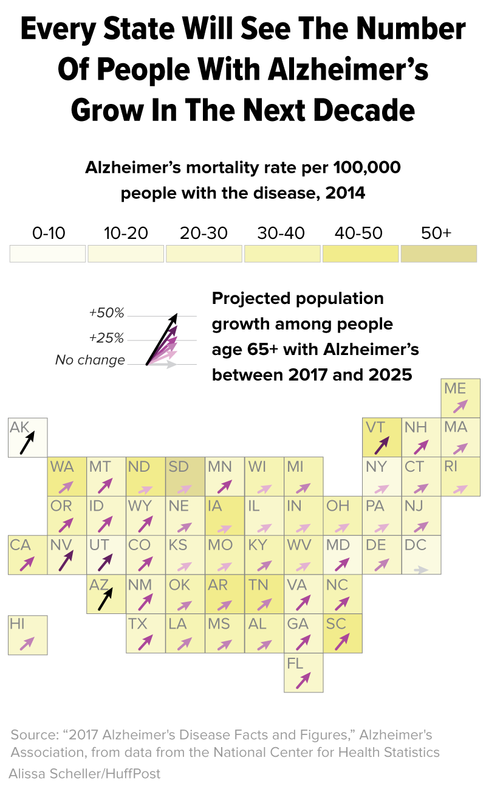 “One in four seniors with Alzheimer’s are on Medicaid, so the potential impact [from proposed cuts] could be pretty drastic,” Geib said, emphasizing that Medicaid, which covers 70 million Americans, is the only government program that covers long-term nursing home stays. Medicare, the program for older Americans, does not. 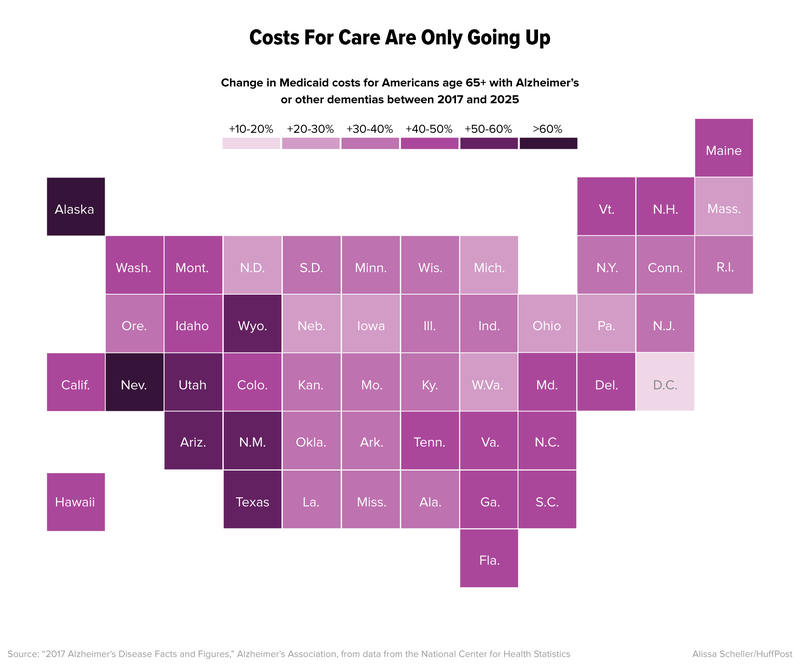 Medicaid also covers some services that allow Alzheimer’s patients to stay in their homes, which costs significantly less than long-term care facilities. Republican Obamacare repeal proposals would end federal funding for Medicaid expansion and then change federal funding for the program as a whole, by applying a type of cap to the money states receive. The current system funds states based on actual expenditures, so states get more money as both the number of enrollees and their medical expenses increase. GOP plans would all but certainly force states to eliminate benefits, curtail enrollment or cut provider rates, said Tim Charles, president and CEO of Mercy Medical Center in Cedar Rapids, which opened a caregivers center in December 2015 to help address the exploding number of people being diagnosed with Alzheimer’s. Any of those changes would have a particularly devastating effect on Iowa’s rural health care system, where Medicaid populations are higher, he added. Already, Iowa’s move last year to a Medicaid system managed by three for-profit companies is affecting people diagnosed with Alzheimer’s and their caregivers. Kathy Horan, vice president of AbbeHealth Aging Services, which operates adult day health centers in Marion, Cedar Rapids and Iowa City, said managed care organizations, or MCOs, that coordinate Medicaid recipients’ care have started to decrease the number of days covered at those centers. Previously, patients could attend five times per week, taking part in activities for those diagnosed with Alzheimer’s and allowing their caregivers respite time. Now, the MCO might authorize just two days per week. “So the stress level on the caregiver goes up,” Horan said. That may end up sending patients into a nursing home sooner, at a much higher expense than care at home, she said. The MCOs also are seeking evidence that day-program patients are making progress. Anne Scherer cares for Alan at their home in West Des Moines, Iowa. Caregivers generally are spouses or adult children of people diagnosed with Alzheimer’s. Called the “sandwich generation,” adults in their 20s, 30s and 40s are often caring for their parent, along with their own children, typically while trying to hold down a job. Kaitlin Scott, 28, of Cedar Rapids, said she never expected to be faced with responsibility for her mother’s health at such a young age. Cindy Khan, 61, was diagnosed with early onset Alzheimer’s and frontotemporal dementia ― caused by progressive nerve cell loss in the brain’s frontal lobes ― at age 59. Scott, Khan’s only child, became the decision-maker for her mother, frequently traveling about two hours each way to Des Moines, where Khan lived, and back to Cedar Rapids, where Scott works as a special education teacher. She hired people to check on her mother and help with errands, “but it got to the point when it was no longer safe for her to live in her home,” Scott said. Her mother couldn’t drive, could not safely cook in her own kitchen, and had difficulty with daily tasks, such as remembering what to do with a toothbrush. “I had to make the hardest decision: to move her out of her home and put her in a memory care facility,” Scott said. Some people have asked why her mother didn’t just move in with her, but Scott said she had to consider her husband, as they had been married just a few years when her mother was diagnosed. Plus, because of her work schedule, Scott was often unavailable. The strains and responsibilities associated with caregiving force an estimated 15 percent of caregivers to leave their paid jobs, creating a ripple effect on the economy, according to Charles, of Mercy Medical Center. Retirement savings for that younger generation also suffer. Nationwide, an estimated 15.9 million Americans provide 18.2 billion hours of unpaid assistance to those with Alzheimer’s and other forms of dementia, according to the Alzheimer’s Association. Iowa alone has an estimated 135,000. “It’s the shadow health system,” Charles said. The task can take an enormous toll. Stanford University researchers have found that Alzheimer’s caregivers have a 63 percent higher mortality rate than non-caregivers, with 40 percent dying from stress-related disorders before the patient dies. Those numbers aren’t lost on Kathy Good, whose husband, David Good, a judge in eastern Iowa, was diagnosed with early onset Alzheimer’s at age 56. The two often rode their tandem bike and David, an outdoorsman, ran two half-marathons after his diagnosis. Kathy took care of her husband at their Cedar Rapids home for eight years before he moved into a care center. He died in 2015. Even with her social work background, she often felt overwhelmed. The stress, she said, likely contributed to health conditions she developed, including rheumatoid arthritis. Kathy now uses what she learned as a caregiver to direct the Family Caregivers Center of Mercy, which opened in Cedar Rapids nearly two years ago as a resource for family caregivers. Financial concerns are among the many burdens the families carry, she said, and they have escalated, of late, with worries about the future of health care funding. Anne Scherer tried to keep up with her tax firm after her husband was diagnosed with Alzheimer's in 2010, but after five years she gave it up to focus on taking care of him. Anne Scherer, a retired accountant who tends to be a planner, has been running the numbers to try to determine what the future holds for her and her husband, Alan, 76, who was diagnosed with Alzheimer’s at age 68. The two live in West Des Moines, where Anne takes care of her husband at home. Alan Scherer, former chief financial officer at the Duluth News Tribune in Minnesota, had a long career in finance, but his forgetfulness ― misplacing keys or his wallet and repeating stories ― became progressively more troubling, his wife said. When he left a carton of milk in a cabinet, rather than the refrigerator, she knew something was wrong. After Alan was diagnosed with Alzheimer’s in 2010, Anne tried to keep up with the tax firm she owned, even bringing him to work with her. She gave it up in 2015. Anne and Alan Scherer still attend movies and baseball games, as well as events created for people with dementia and their caregivers. The two still go bowling, to movies and to baseball games ― Alan coached their three sons as youths. They sing together and attend programs, such as the “Memory Cafe” through the Alzheimer’s Association and WesleyLife, a nonprofit that offers services for older adults. Participants with dementia and their caregivers share experiences and laughs at the social Memory Cafe events. Some people ask why she takes her husband places he won’t remember. “People say it’s not remembered, but I remember,” she said. Anne Scherer helps Alan with everyday tasks. Physically, Alan is healthy, but he needs help with everyday chores such as bathing and getting dressed. “Nothing is independent,” she said. During an interview, he couldn’t come up with the word for “ring,” when Anne pointed to the jewelry on her hand. He retains a sense of humor, though, which has helped their marriage. Anne Scherer enjoys making memories with Alan, including singing on their porch. Anne says that even if Alan won't remember these moments, she will enjoy looking back on them. Anne said she worries about what will happen when she can no longer care for her husband at home. Funding has been cut for one of the programs where Alan spent time twice a month with others diagnosed with Alzheimer’s, giving Anne a few hours off from the 24/7 care. They cannot afford private-pay nursing facilities, which can cost more than $100,000 annually. When Alan finally requires nursing home care, they would spend through their savings and then rely on Medicaid, she said. Cindy Hadish is an Iowa-based freelance journalist who writes for IowaWatch and other media outlets. Read more from IowaWatch here. <a href="http://www.alz.org/alzheimers_disease_10_signs_of_alzheimers.asp#signs" target="_blank">The Alzheimer's Association</a> says that people who have the illness may find it difficult to complete daily tasks. These could range from cleaning to forgetting the rules of a game played regularly.